In Nigeria's recent history, June 12 has become a very special and important day. It has become a symbolic day that reminds Nigerians of their history of many shattered dreams, of a fact that the ordinary folk of this country cannot even be allowed to become what they want to become, to choose the leaders that they want to choose for themselves. June 12 is also the birthday of a remarkable Nigerian, a man whose type graces this world once in an epoch. 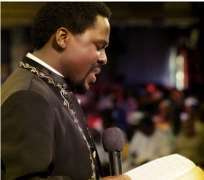 On June 12, this year, Temitope Balogun Joshua, Nigeria's healing pastor, extraordinary preacher, prophet and humanitarian, turns a mere 46 earth years. But it is only God Almighty Himself (judging by the profundity and wisdom exhibited by Joshua) who can tell the real age of this prodigious man of God. Until I watched the story of Nigeria's beleaguered dwarves on Prophet TB Joshua's Emmanuel TV early this year, my attitude to organised religion had been one of total indifference, if not downright hostility. And who could really blame one for this? If the general attitude of many of our today's religious people and their leadership is anything to go by – and I mean of every popular religion in this country – then, it is time to consider Satanism as an option! It is also impossible for any serious African, a student of history and one who has taken pains to research into Black history and avail himself of facts, of the role that religion (particularly Christianity and Islam) played and still plays in the subjugation of the Black race, not to be bitter towards and suspicious of anything religious. This is only human. The world, for instance, annually celebrates the very unfortunate fate of the Jews in the concentration camps of Auswitch and Birkenau. But nobody ever mentions the horrendous massacres and enslavement of the Bakongo of five centuries earlier and the fate of the last Mani-Kongo who even transmuted to Dom Afonso I, from Nzinga a Mvemba, on conversion to Christianity, thinking he was dealing with honest people of God. Today, the ongoing genocide in Omar al-Bashir's Sudan is there for all to see. But what is the so-called civilised world doing about this evil and well-orchestrated decimation of Black African populations in that country? Why are even other independent African nations pretending to be doing something, whilst the long-suffering people of Darfur are steadily wasting away? Because of the long history of struggle for survival of the Black race and the many terrible things that have happened to our people in the past and still continue to happen, many African elite have turned sceptical to matters of religion. This cynicism is aptly captured by the battle song of one of the leaders of the Haitian Revolution, (1791-1804) Jamaican-born Bookman Dutty, now famously referred to as “Bookman's Prayer”. That revolution, begun almost half a century earlier by Maroon leader, Francois Makandal, was carried to a successful conclusion by Black fighters, under Jean-Jacques Dessalines. Unfortunately, the struggle came to a tragic end when the White agents of Napoleon Bonaparte tricked the last leader of the revolution, a mulatto named, Toussaint L'Ouverture. Toussaint was promptly shipped to exile in France where he was executed by means of starvation and cold. The revolution was thus extinguished and since then, Haiti, the first independent Black nation on earth has never been allowed to be the same. And neither has Nigeria, either, since our so-called independence – this Nigeria of ours, the one Black nation on this earth with the capability and enough resources, human and material, to strike out on its own. The deepest roots of Nigeria's myriad of problems lie in matters of race and religion. For me therefore – and like I believe, for many of my kind – Jesus Christ merely became a symbol of Western deceit, cheating and thievery. Everything about the Christianity into which I was born irritated me completely, until I discovered Prophet TB Joshua's brand of practical Christianity. In the name of the same Jesus Christ that one viewed with great suspicion, the man heals the sick, preaches the gospel in his own unique way, gives without any reservations whatsoever and sees deep into the future and even into people's private problems, to reconcile feuding families, among other things. But anybody who has taken pains to study the principles of some occultic practices would know that with Joshua's many diverse capabilities, it is not possible to combine darkness and light, at the same time. This is a simple fact of nature. No one occultist could combine the many capabilities of Prophet TB Joshua – not even great masters like Abramelin the Mage and Aleister Crowley could. Such endowments as he has exhibited, coupled with his personality, can only come from an enlightened soul, directly connected to and tapping from the highest source of Light. Those who have taken the trouble to study the man at close range would understand what I am talking about. Ironically, like Nigeria his country, Pastor Joshua has not been allowed the peace of mind he deserves, to continue his good work of charity by, of all people, his fellow Christians. I just read an interview granted a magazine (or is it newspaper now?) by Pastor Ayo Oritsejafor, the current President of the Pentecostal Fellowship of Nigeria, PFN, in which he declared that Pastor Joshua is not of God. Pastor Oritsejafor was also quoted as having demanded to know who Prophet TB Joshua's mentor is. Let me begin by asking Pastor Oritsejafor who his own mentor was and who his own mentor's mentor was. Secondly, by whose authority were both himself and his mentors ordained pastors? Having said that, by whose authority has he declared that anybody is not of God? Hasn't his own Bible told him yet that judgment is only for the Most High Himself? Well, if a man should disobey the Biblical injunction simply because he is the president of a Christian group and pass judgment unto his fellow man – something that is an exclusive preserve of God – then, he is not doing God's will. By that very token, he is not of God! It is amazing that anybody who lays claim to being a pastor of God (like Pastor Oritsejafor of the PFN does) should be talking about mentoring in matters of the faith as if talking about some rookie artisan being shepherded into 'freedom' from his master's workshop. Such drivel simply speaks volumes of the man who utters it. It reveals the depth of vulgarity to which our 'modern' men of God have allowed the gospel of Jesus Christ to sink. Anybody who boasts in God's vineyard about his mentor and such other inane subjects as earthly endowments has simply not imbibed the lessons of Christ's personal life. Jesus Christ the Son of God could have been born a prince, if He so chose. On the contrary, God made man, decided to come into this world, the son of a wretched carpenter born in, of all places, a manger and side-by-side animals! He had neither an earthly mentor, nor did the Bible tell us that He had doctorate degrees in sacred theology and dogmatic philosophy. In His divine wisdom, God chooses whom He crowns king and decides whom He endows with any gift He likes – and we all have our different gifts. Anybody who challenges this wisdom of God Almighty blasphemes against Him, by querying His authority. So, why would God choose a humble, even innocent, or bucolic Temitope Balogun Joshua for the enormous anointing he has received? Why didn't He pick one of those blue-blooded, Oxford-trained peers of the realm? One cannot exactly tell and neither can anybody else, for that matter. However, having watched Pastor Joshua very closely these past few months, followed with keen interest, the documentaries of his early ministry and his teachings and other activities on Emmanuel TV, physically witnessed his Sunday healing and miracle services at the Synagogue Church and had numerous private audiences with him, I have been privileged to glean a few facts and to learn a very important lesson about faith, from this soldier of Christ. As humans, we usually crack in the daunting face of adversity. In fact, at some point, many of us not only give up on God, we even dare to turn against Him. In the case of Prophet Joshua, the harder the battle to survive, the greater his loyalty to his God appears to be. I have never seen anybody with such unshakable faith in what he believes, such optimism that may even look to an observer during those his ministry's early years as mere folly. Anybody who has seen that documentary on his early ministry, of his first church (a miserable looking shack, with about 20 worshippers) and the optimism with which he prophesied how the whole world would soon come to Synagogue Church, would simply be awed by the power of the living God and testify to His glory. A little later during those early years, Prophet Joshua who leads by example went down to such fine details as personally cleaning the toilets of the church for three long years. As he says, “In order to be able to manage success, I had to first learn how to manage poverty”. As bad as things were then, Pastor Joshua was always seen ministering to his flock with a broad smile, even as his first, second and third churches, drowned in flood waters. Those who today want to give Christianity a highfaluting image and discriminate against their fellow men either do not know, or simply forget its humble beginnings. The cross, the banner under which all of Christendom gathers derives from an ancient mystical symbol, which many may refer to as (sorry for that derogatory word) pagan. The Celtic cross, a religious symbol seen all over Britain, Scotland, Ireland and Wales, has a long history that presages Christianity itself. Its four arms are interpreted as the four elements of earth, wind, water and fire. It also represents the four directions of the compass – north, south, east, west – and the four parts of man – mind, soul, heart, and body. This is also the basis of the Jewish Tetragrammaton, represented by the Hebrew letters, Yod, He, Vau, He, with the last He, bearing a dot, symbolising completion, just like the shoot of a dormant seed. Those four Hebrew letters, together, spell out Yahuvah, or Jehovah, the elements that emanated from the Divine Essence at the point of Creation, as documented in the first chapter of Genesis. I had written extensively about this in the past and the correlation between this Biblical account of the beginning of space-time and the Quantum Theory in particle physics is indeed amazing! One and the same concept runs through most major mystical-religious concepts of all civilisations, worldwide, from ancient, so-called primitive African and Amerindian cultures, to Indo-Chinese, European and Arabic cultures and more. This universal symbolism is seen in the Popol Vuh, the Holy Book of the Quiche Maya of South America. It is the Yin and Yang of Taoist China, also symbolised by the Dance of Shiva, in the Indian Sanskrit. Back here, in Africa, this same symbolism is seen in the ancient drawings of the Dogon of Mali, as it is in Ghana's Adinkra culture. It is the Creation Snake that Wole Soyinka talks about in his “Idanre and Other Poems”, which the Igbo celebrate in the New Yam festival, the basis of their four market days and their lunar calendar, depicted by the Uli motif of the kola nut head. Ancient Egyptians equally celebrated the feast of Eostre in honour of the goddess of fertility and the endless cycles of the death of winter and the birth of spring. The Romans borrowed the same practice and baptised it Saturnalia. It is this very old belief, depicted by the image of the Egyptian Ankh or the Crux Ansata, which found its way into Judaeo-Christian theology, that the first Christians adopted and celebrated as Easter, directly borrowing its name from the goddess: “Unless the grain falls into the ground and dies, it remains alone; but if it dies it brings forth much fruit.” (John 12:24). To think that the symbol of the very basis of the Christian faith, the death of Jesus Christ on the Cross of Calvary and the power of New Life in the Risen Christ, had its humble beginnings in the faiths of peoples we would now rather turn up our noses at, as pagans, is a lesson in God's own humility and mysterious but wise ways. It teaches us never to look down on anybody but rather, to embrace all. From the high priests of quantum physics, to the lowly African chief priests and sages, to our modern, “funky pastors”, we should have nothing but respect for our fellow man, for it is only God Himself who can tell who worships Him in truth and in spirit. This is another major lesson that Pastor Joshua teaches everyone with his unique ministry. At the Synagogue Church, you find people of all races and creeds. You find the very rich and the very poor, the homeless, beggars, everybody, side-by-side. You even find grandmasters of the occult that have come to receive deliverance. Nobody discriminates against anybody and people are actually encouraged after receiving their healing, to go back to their respective churches or mosques. I am yet to see this in other Pentecostal churches and this ecumenism, I believe, is the message of Christ's mission while on earth. It is absolutely impossible for a man to be 'upright' and 'evil' at the same time, just like we are yet to see one who I tall and short all at once. Also, while we may not be able to easily fathom the machinations of the human mind, we can see a man's actions and hear his utterances. It could thus be inferred that those who indulge in running down Prophet TB Joshua do not seem to have seriously pondered nature and the several basic principles that govern it. Their reason for criticising that which they apparently do not understand, appears to be either simple ignorance or sheer malice. All of these people that bandy false tales about the man and his church have apparently never been to The Synagogue Church to investigate the rumours they have heard. Anybody who does so, or even merely follows the activities of the church, beamed to audiences worldwide through Emmanuel TV, would see the glaring truth. No evil man would be capable of faking the personality of Prophet Joshua – his self-denials, his love for man and nature, his charitable disposition, his prophecies and healing and the fact that he does them in the name of Jesus Christ - and above all, his highly inspired interpretation of the Gospel. Like I have said here before, apart from his amazing miracles, two striking qualities mark Pastor Joshua out as you encounter him are his disarming humility and childlike simplicity, as well as the depth of wisdom in his preaching and interpretation of the Bible. Down to even his private life, I doubt if there is any PFN pastor in this country who can meet the very high standard of discipline that Prophet Joshua has set for himself, for all to see. The man lives right inside his church and hardly step out of the premises because 24 hours, seven days a week, he is always available to thousands of people that throng the Synagogue Church from all over the world – the sick, the distressed, the widowed, the poor, everybody, people with all kinds of personal and communal problems, even financial problems. Only last week while I was with him, his aides came to tell him that a batch of over 100 South African who he had hurriedly spent all day ministering to so they could return home, had missed their flight. They were caught in the notorious Isolo traffic. When he told me he would have to cater for these people fro two days, I was surprised - but that's the kindness of the man we are talking about. At first, I could see he was a little disturbed, but then he shrugged it all off in his usual 'God will provide' manner. Instead of collecting and amassing fortunes like those who accuse him of evil, Joshua the pastor, the father figure, keeps giving away. If that man were after money and the material things of this world, I doubt if any human being alive today would be half as rich as he could get, given the capabilities of a man with his healing powers and ability to prophesy for the whole wide world as well as individuals, with pinpoint accuracy. On one particular occasion, I had been at The Synagogue Church all day, going through archival material at the Emmanuel TV studios while waiting to see him. There were hundreds of visitors from around the country and the world over, with various pressing needs to whom he must minister, individually. He still eventually made out time to see me quite later in the night, with his usual apologies. In his tiny office that may not even be big enough for the personal assistants of some of our 'funky pastors', the prophet, too busy to even stand up sometimes, eats his meals, prepared from the same source that he serves - even street beggars. The man who lives by example is yet to outgrow the standard he set for himself in the very early years of his ministry when he had to do everything by himself. Till date, he still joins his disciples and staff in manual work like carrying bags of food meant for the needy. It is important to point out these facts because no man who is possessed of negative forces would radiate the kind of peace and harmony that Prophet Joshua does, which affects everybody and everything around him, even little children. His uncommon and very large capacity to forgive cannot flow from an evil soul, and this appears to be one loophole that some of the people who were once close to him now exploit to try to run him down. Unfortunately for them, Prophet Joshua, a man of vision, is a meticulous keeper of records. Those who associate Prophet TB Joshua with occultism certainly do not know what they are talking about. Every occultist pays a high price as he ascends the ladder in his hierarchy and lack of genuine peace is one of those great prices. Two occult masters who went through deliverance at The Synagogue Church, Mozambique's Agostinho Jefue (pronounced Jack) and 'Professor' Nathan Chukwudi Okakpu of Nigeria, who described himself as a grandmaster of science beyond material, both confirmed this. On the other hand, a holy man achieves that bond with the Holy Spirit such that he becomes part of everything. Nothing can escape his eyes or ears, for every part of His being – his eyes, his ear, his hands, his thoughts – become God's tools. With God's tools, you can only do good things, for the benefit of man and to His glory. It should be more worthwhile for these critics of Prophet Joshua to humble themselves and study his life and learn from his wisdom, rather than listen to the folly of their own minds. What God has bestowed upon His chosen servant, no man can take away, no matter whom. At 46, this writer wishes Prophet TB Joshua many, many more years of service to God and to humanity – ad multos annos!